On June 20th, Mr. Hu Jining, Peng Dening (driver), a Fule middle school teacher Mr. Wang and my son Peter went to 8 students' home for an visit to their family situation. Among them, 4 are this year's high school graduates, 2 are middle school graduates, one in 7th grade, and one in 8th grade. Since we went down on Friday, the 7th and 8th graders are not at home so we talked with their family members. It happens that 4 are in the same `Chong' (冲）---a long narrow volley between two mountains, and the local teacher knows the area really well, we were able to visit 8 family instead of usual 5. They are indeed all very poor and appreciate the support very much. The following are brief descriptions of their situation. Please support us and the kids with your generous donation via PayPal (left) or check (send to us). 100 percent of your donation goes to the needy students! 沈聪 （Cong Shen）， a 12th grader boy. He was supported by us since 7th grade. His mother is handicapped with both hands and legs and with some other health issues. His father does odd jobs nearby to support the family. He likes basketball and is outstanding in school, top 100 in Ningguo County/city. He is pretty confident with his college extrance exam and hopes to get into a top military university so he does not need to pay any tuition. 洪艳 （Yan Hong), a 12th grader in Ningguo. She has been supported by Zhu and Lv since 8th grade. She lives with her parents and an older brother. Her father had shoulder surgery. She likes language. They rent a small apartment (built long time ago) provided his mother's company. Yueqin Zhou (周月琴）。 She is a 12th grader. She was also supported by us since 7th grade. She lives with her parents and her sister (4th grade). His father has serious back pain problem and can not do heavy work. They live in a moutainous area but do not have much their own land. She has been sponsored by Au-Yeung. 游昌平(Changping You)， a 7th grade boy. He lives with his parents and an older sister in college. His mother has chronical disease and can not work. His house is clearly worse than his neighbors'. The village does his father a favor to give him a job collecting trashes (paid by the government). We did not see himself as he is in school, studying and preparing for the upcoming final exams. 洪明识 （Hong Mingshi), a 7th grader boy. He was supported since 3rd grade when he was found to have heart disease. After a big surgery in Shanghai and some small surgeries in Ningguo， he seems ok now. He stayed in 3rd grade for 2 years. He lives with his parents and his older sister. His father has some chronical disease and can not work hard. The family have only one person's land (his mother's). To add to the misfortunte, his sister got injured and lost almost half a finger last December while working at Guan Dong (without contract yet, so the compensation is very limited). We did not see the boy as he was in school. 周吉利 （Jili Zhou, above), a 9th grader girl born in 1998. She lives with her parents, and is ready for high school next Fall. Her father has high blood pressure while her mother has very low blood pressure and kidney stone. She lives about 10 miles away from school and usually stays in school during weekdays. She is in top 10 in her grade (about 50 total) and hope to get into the best High school in Ningguo (still waiting for result). She wants to be a doctor to help patients. She has been sponsored by Lin and Wang. 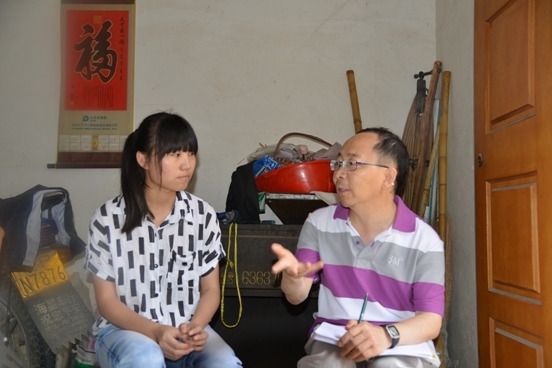 方慧玲 （Huiling Fang, above), a 9th grader girl with aged grandparents of over 70， parents, and an older sister in 12th grader. Her mother has had surgery and still can not do work. Her father does brick work to support family. She likes sports and Chinese.